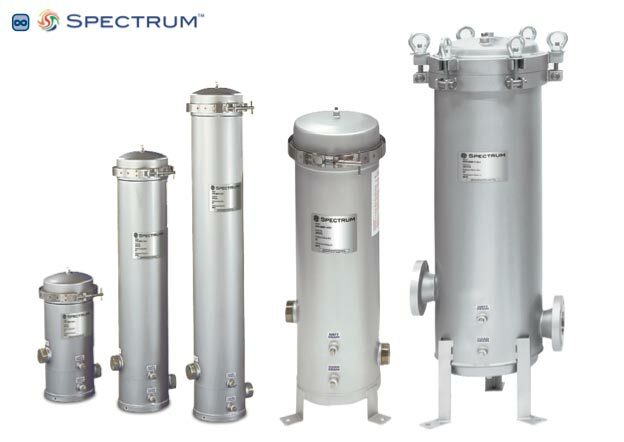 The SPECTRUM Inox range of filter housings starts with the 5 round housing, 1 available in 316 L stain less steel with 2″ male BSP ports, 2x /2″ drain ports and 1/4″ vent in the cover now come complete with universal cartridge adaptors, capable of accepting both DOE and 222 cartridges. Drain ports allow for quick and easy cartridge change-out and can also be used as gauge ports – one upstream and one downstream. The 7 and 12 round vessels come with mounting legs to aid installation, the 12 round also comes with 3″ ports, all other specifications remaining the same. A swing-bolt closure is available as an option on all 5, 7 and 12 round housings. Upgrade to the Inox Premium housing by changing the code from SFH to PFH.